Writer Paul Dini is already off the project, but a new developer is unlikely to please fans. CVG has unconvered an excerpt from Warner Bros. Q4 earnings call wherein CFO John K. Martin sets a date for a new Arkham game, "We expect [digital home video revenue] to grow close to 20% in 2013. 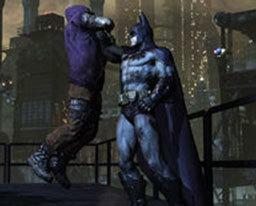 And we also have a strong games release this year, which will include the next release in the Batman Arkham franchise." The last game in the series, 'Batman: Arkham City' was released in 2011, making 2013 seem like a reasonable amount of time for a sequel. Oddly enough, rumors have surfaced that series developer Rocksteady will not be at the helm this time. Destructoid has even gone so far as to suggest Spark Unlimited as stepping in. If true, then Rocksteady would likely be on another project altogether. This after last year's rumors that Rocksteady was working on a Silver Age of comics prequel to first Arkham game. Last summer, Paul Dini, writer for the story of both Arkham games, announced that Warner Bros. had encouraged him not to wait for or to expect to work on a third installment and as a result he took on other projects to the point that he is no longer available for work in 2013.